The kit with cable is designed for applications under tile, stone and nailed hardwood floors.This free-form cable provides flexibility to customize installation for rooms of any size and shape. It features a twin conductor with a 15 cold lead and it can be installed at 3 spacing on the floor. Comes with the programmable nSpire Touch which features a 3.5 full colour touchscreen and a modern design that instantly augments any rooms style. The nSpire Touch allows you maximum control over the floor temperature with 4 programmable events for each day of the week. This dual voltage 120V/240V thermostat includes floor sensor. The Prodeso Membrane minimizes efforts while fitting a heating cable for electric floor heating. This heat membrane allows quick installation of tile and floor heating over a variety of different substrates, such as plywood, concrete slabs or wherever heat is desired. No waiting required after installation so you can begin laying the flooring immediately. The DHERSD/BW is a programmable digital thermostat designed to control the Ditra-Heat heating cables. There are over 250 pre-set programs including an anticipated start function to choose from. It also has a built-in ground fault circuit interrupter (GFCI) and works with the 120-Volt and 240-Volt cables. DITRA-HEAT-E-R is a non-programmable digital thermostat used to control the DITRA-HEAT-E-HK heating cables (either 120 V or 240 V). The thermostat features a 5 mA built-in ground fault circuit interrupter (GFCI) with indicator light and includes a floor temperature sensor. DITRA-HEAT-E-R is operated via a simple on/off switch. Two heating cables may be connected to the thermostat, up to the total heating load limit of 15 amps. The DITRA-HEAT-E-RR power module may be used in conjunction with the thermostat when the heating load exceeds 15 amps (e.g., in large floor applications) to maintain a single point of control. The True Comfort non-programmable electronic dual-voltage thermostat guarantees perfect comfort at all times. With its chic design and easy and intuitive manual control, the non-programmable thermostat is the ideal device to set your level of comfort. Simply push the up or down buttons to set the temperature and you're done. 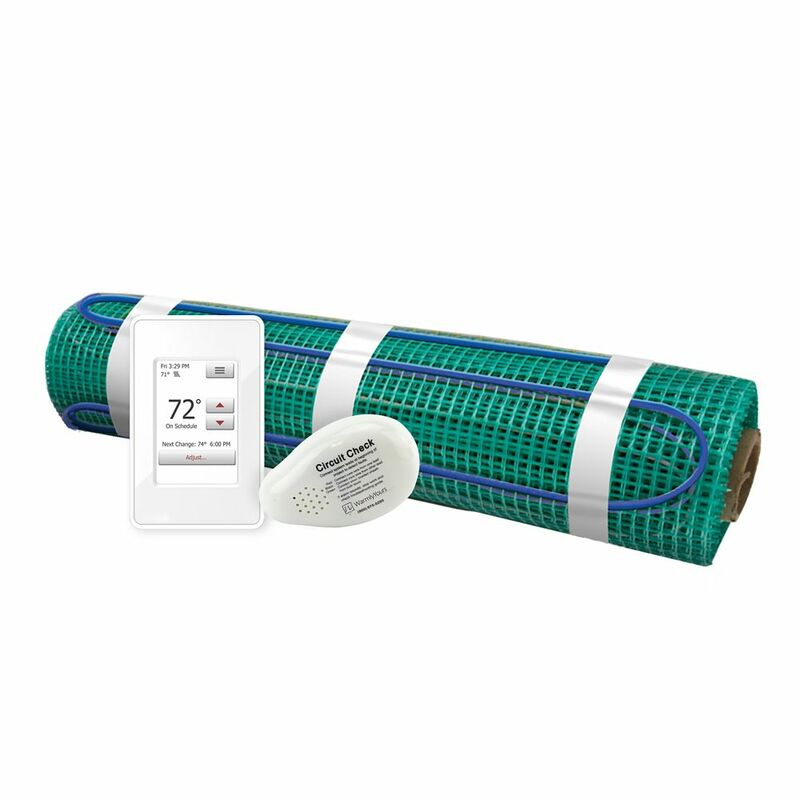 Floor Heating Kit 120V-Tempzone Flex Roll 1.5 Feet x 15 Feet + Touch Screen Thermostat The kit with cable is designed for applications under tile, stone and nailed hardwood floors.This free-form cable provides flexibility to customize installation for rooms of any size and shape. It features a twin conductor with a 15 cold lead and it can be installed at 3 spacing on the floor. Comes with the programmable nSpire Touch which features a 3.5 full colour touchscreen and a modern design that instantly augments any rooms style. The nSpire Touch allows you maximum control over the floor temperature with 4 programmable events for each day of the week. This dual voltage 120V/240V thermostat includes floor sensor. The Prodeso Membrane minimizes efforts while fitting a heating cable for electric floor heating. This heat membrane allows quick installation of tile and floor heating over a variety of different substrates, such as plywood, concrete slabs or wherever heat is desired. No waiting required after installation so you can begin laying the flooring immediately. Floor Heating Kit 120V-Tempzone Flex Roll 1.5 Feet x 15 Feet + Touch Screen Thermostat is rated 5.0 out of 5 by 1. Rated 5 out of 5 by Tiptop from Easier than I thought Read everything before you start and talk to an electrician so you order the right voltage. Very good product. Very versatile.